This letter was written by Milton Charlton Hutchinson (1841-1865), the son of Robert Eads Hutchinson (1817-1892) and Rebecca Charlton (1820-1886). 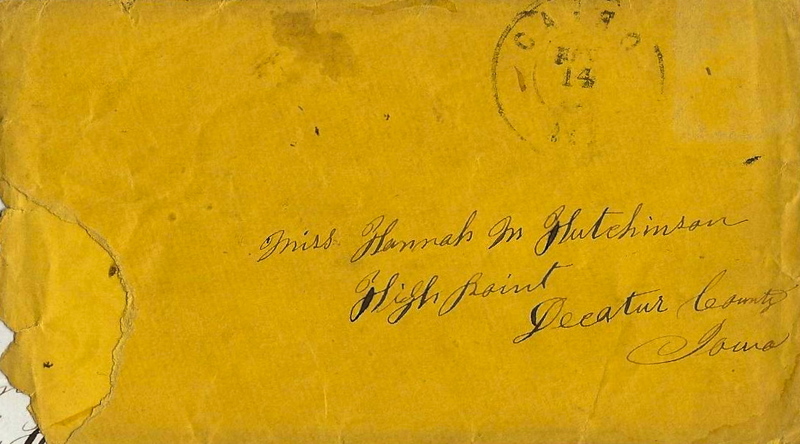 Milton wrote the letter to his sister, Hannah M. Hutchinson (1842-1895). Milton and Hannah had several siblings but the only other one mentioned in this letter is George W. Hutchinson (1859-1930). The Hutchinson family moved from Ray, Franklin County, Indiana, sometime after the 1850 Census was taken, stopping briefly in Henry County, Illinois, and finally settling in Highpoint Township, Decatur County, Iowa. Milton enlisted for three year’s service in Co. F., 34th Iowa Infantry, at Burlington, Iowa in October 1862. By the time this letter was written in late 1864, the strength of the regiment had suffered so severely that it was consolidated with the 38th Iowa and renamed the “34th Consolidated Battalion.” Milton was transferred into Company E at that time. At the time this letter was written in November 1864, the 34th Iowa had just left Morganza, Louisiana, where it had been doing outpost duty along the Atchafalaya River for four weeks. We learn from this letter that the 34th Consolidated Battalion of nearly a thousand men were transported to the mouth of the White River in Arkansas on board at least two troop transport steamers — the Illinois and the N. W. Thomas. They were posted there until 25 January 1865 when they were transported to Florida. Unfortunately for young Milton, he was not able to return home as he promised his sister, “unless something happens to me.” He was killed on 9 April 1865 in the attack on Fort Blakely in Baldwin County, Alabama — the last combined force engagement of the war. The 34th Iowa suffered 1 officer and 11 enlisted men who were killed in action or who died of their wounds and 2 officers and 244 enlisted men who died of disease, for a total of 258 fatalities during the Civil War. Again I will try to write you a few lines. It has been some three weeks since I have written to you, not because I did not want to write but because I have been a part of the time where I could not write & part of the time where I could not mail letters — though I have wrote some two or three to pap since I have wrote to you. The last month that we was at Morganza [Louisiana], ¹ there was 22 days of the time that we was out of camp reconnoitering through the country & the first day of this month we left Morganza for up the river & are now some 50 miles below the mouth of White River. The general supposition is that we will go to to Duvall’s Bluff on White River though for my part, I do not know where we will go. It may be that we will go to Memphis. We have had rather a wet, disagreeable time since we left Morganza at it has been raining the most of the time & there is three regiments of us on this boat & are bad crowded & the weather begins to feel cool. You may think it strange that I would notice the cold this far south at this eason of the year but it is so we can begin to notice a change of climate & the wind feels quite cool though it is much cooler here on the boat than if we was out on the land. I do not hardly know how we could endure the cold if we was to be taken as far north as where you are for we have been here in a warm climate for so long that a light frost that we would hardly notice in Iowa makes us hunt our overcoats & build fires. Well, I must go to dinner. Well now I have finished my dinner I will finish my letter. The boats have landed to repair some of the works that has given out on the N. W. Thomas. We are landed on the Arkansas shore & the ground completely shaded with a heavy coat of timber that reminds me of old hoosier. The timber here has not dropped their leaves yet though there is some of them that are beginning to look yellow from the effects of a couple of light frosts. You said that George said he wanted me to come home & go to school with him. I should be glad to go with him if I was there. Tell him that he must study his lessons well & learn to write so that he can write me a letter. If nothing happens to me, I shall be with you in less than another year. Although I have been from home over two years, the time does not appear long to me & if I am blessed with as good health in the year to come as I have had in the last, the time will not appear long. And when my time is out, I expect to go home. And if the war is not ended, there are some at home yet that are stout & hardy. I will let some of them take my place for I think that there are some of them that will make good soldiers. Tell pap that I have received his letter of the 16th of last month & will answer it as soon as I can. I do not know when or where I will get to mail this but I will have it ready if there is a chance. You must write to me often & let me know what is going on in the neighborhood. You are at home & can write at any time but I have to do my writing anytime I can get a chance. Writing with my paper on my knee & the rim of the boat makes quite a jarring. ¹ Morganza, Louisiana, is a small town on the west bank of the Mississippi River thirty-five miles above Port Hudson.